Well this week has found a few cloud free nights to try out the new 80mm refractor and look at the first light through that device, but first we should cover the recent lectures by Nobel Laureate, Art McDonald, and take a look at the mail. I attended both the public lecture and the physics colloquium lecture the next day. The public lecture was pretty much to a full house at the Barclay theater where Professor McDonald reviewed the background of the neutrino experiments 2.5 km underground at a nickel mine in Sudbury, Canada and how the results found there and in conjunction with the results from the Kamiokande detector in Japan, established the finite mass of neutrinos, verified the solar neutrino flux models and oscillation from one neutrino type to the other two types. The public lecture was fun and full of anecdotal stories and the colloquium talk covered more of the technical details. Now I don't have enough of a background in neutrino physics to understand most of the talk, but one question I always had was answered. I wondered how you can tell that you are only measuring 1/3 of the all the electron neutrinos that were thought to have been generated in the sun and you were able to tell that the solar flux model was correct and that something happened to the electron neutrinos on there way from the sun to the detector on the Earth. Well the answer explained there is that following up on a recommendation by a UCI researcher, who proposed that the detector should be filled with heavy water, which is just like ordinary water but in which some of the hydrogen is not the normal light weight version, but the heavier version, deuterium, that the total number of neutrinos could be measured. Deuterium has the good property that it responds to electron neutrinos by emitting a photon of a particular wavelength and it responds to all three types of neutrinos by emitting a photon of a different wavelength. So, by counting the number of each type of emitted photon, the correct number of neutrinos could be measured. After hearing that key point, I got lost in the many of the other details. This Hubble image pans across the globular cluster and the view is fantastic. I found myself just looking at the beautiful scene time after time. Thanks for that, Gene! We also received an excellent review paper covering how astronomers have been pursuing for many years now, an alternate view of what constitutes dark matter, which could consist not of tiny microscopic particles, but large massive objects, one type of which are primordial black holes. The paper is very descriptive and reviews various studies and does not contain a lot of mathematics. Packing up and Moving to Vegas, Gravity Guy Ken, found this excellent review article and passed it on. Thank you for that, Ken! I am looking forward to going over the paper in more detail. A key point is how the various studies over the years have kept slicing off areas where these large objects could be hiding. 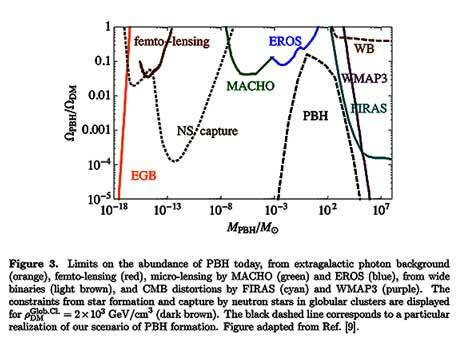 Check out the graph below which shows how Primordial Black Holes (PBH) of the proper size, up to hundreds of solar mass, could be hiding and still explain the gravitational effects of dark matter and why they have not been found by other searches. Thus MACHOs, large Jupiter size dim objects are found not to be able to explain dark matter because we can measure how many of them might be out there and that amount is not enough to explain dark matter. One thing I learned about primordial black holes, which cannot be observed directly either, is that they could have been formed during the early history of the universe, in the radiation era before particles of ordinary matter would have formed. This seems to mean and to explain why the existence of these black holes would not upset the calculations and experimentally verified results of baryogenesis. Well, I wanted to try getting a longer exposure of M1, The Crab Nebula, as we have discussed in previous posts, but, wouldn't you know it, I had problems right away with aligning the new mount. Just as the mount started slewing to the first alignment star, in this case Rigel, in Orion, the RA motor drive started some awful screeching and wouldn't finish the slew to that position. I found that one of the power cables was binding and preventing the proper rotation in the RA axis. 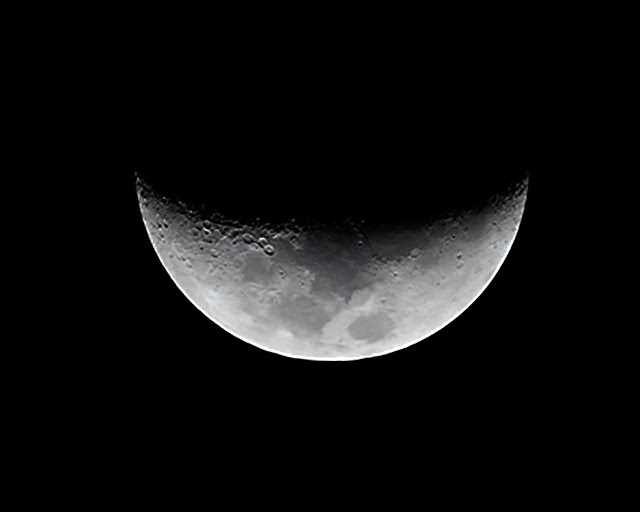 More about that later, but, I didn't give up, after some last ditch efforts to reposition the tripod, I just resorted to driving the mount manually and just pointed the scope at the moon. 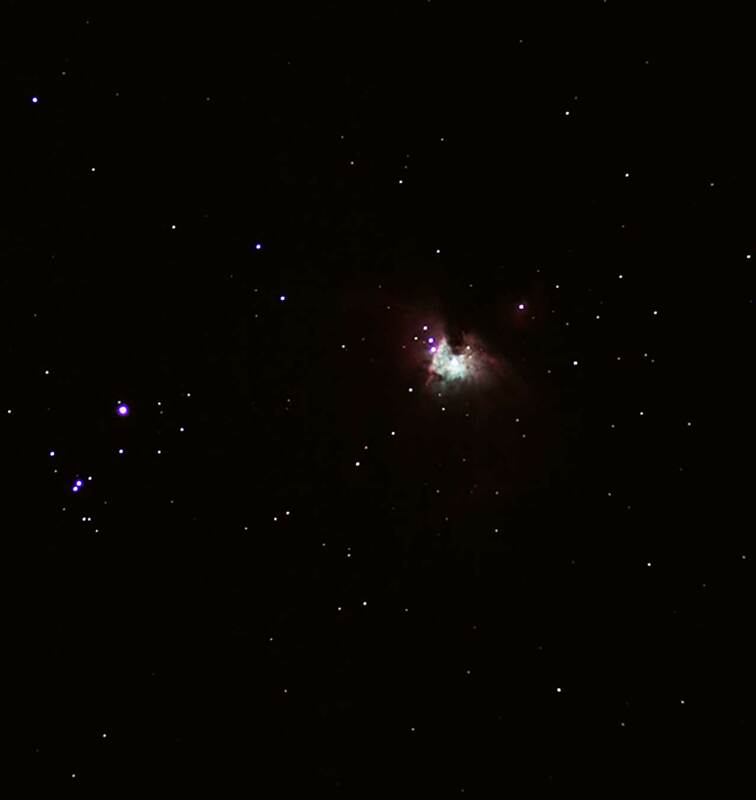 So, that looked pretty good and since the mount was tracking for Earth's rotation, based on being set up in pretty close polar alignment, I pushed the command buttons to goto the area near Orion's nebula. I picked this object, because I could just barely see, in the polluted city lights viewing, where it was located. The image below is a 15 second exposure. So, I couldn't really naked eye see much of anything else, so I just called it a night. I knew I would have to fix the binding power cable before I could finish up a good alignment and then go back and try to get M1 and other objects. You might be wondering why the power cable was binding up? Well, I didn't know I would need any special kind of cable from my battery to the mount, so I just used the power cable I had available, which is the one on the left hand side of this photo. This straight power connector is just too long and when the mount rotates around the RA axis, it can only go about 50 degrees, rather than the full 90 degrees. It turns out what I needed was a right angle power connector, like the one on the right. 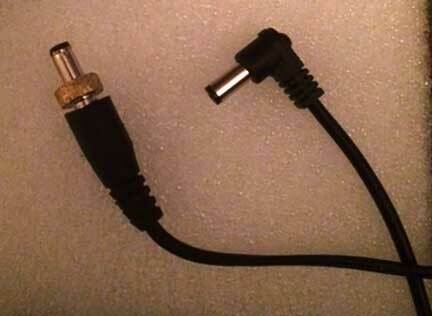 This power connector came with the mount, but it is permanently connected to the AC powered adapter, which I couldn't use because I didn't have any AC available power. Ok, ok, I found one on line and now with $20 + shipping and a couple of days waiting, we can try out the whole thing again. I had a few other mishaps when I first turned the mount on. For some reason, the time offset from Greenwich Mean Time, was set to +480 minutes, rather than -480 minutes. This presented some interesting pointing errors as you might expect. Also after that correction, I found that I had inadvertently set the local time based on a 12 hour clock rather than in 24 hour format. All you amateurs already know about all these kinds of operator errors that we always need to be on the lookout for. Anyway, the new scope and mount are quite light weight and it was not a chore at all at getting it all transported and set up. I might have one more chance this week, after the power cord shows up on the doorstep, if the weather forecast continues with clear skies latter in the week. I don't have much time this week because I have to be in Santa Barbara for the 33rd Pacific Coast Gravity Meeting. I went to the 30th PCGM in San Diego, 3 years ago, and found the meeting mostly way over my head, but I did learn some of the buzz words and what topics were being studied. Now after 3 more years of study I'm a little more prepared, but most of the titles of the presentations are still pretty much incomprehensible. Oh well, I guess its all just par for the course for all physicist wannabes.